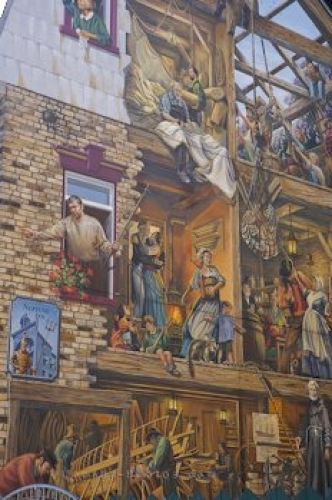 Hours of work was put into creating the wall mural in this picture that is exhibited along Rue du Petite-Champlain in Quartier Petite Champlain, Old Quebec. A mural created with an incredible amount of detail adorns a wall along Rue du Petite-Champlain in Quartier Petite Champlain in Old Quebec City, Canada. A different activity takes place in each room with intricate features in the decor of the rooms and on each person. Tourists that come to Old Quebec, can not resist the temptation of taking a picture of this wall mural. Wall mural along Rue du Petite-Champlain in Quartier Petite Champlain in Old Quebec, Quebec City, Quebec, Canada. UNESCO World Heritage Site. Picture of a wall mural along a street in Quariter Petite Champlain in Old Quebec, Canada.